These slip-ups are in fact common primarily because the underlying bias is accidental. Check out any publication talking about HR these days and you'll see that diversity and inclusion is a hot topic. And we're totally on board and encouraged, because from any and all angles -- ethically, socially, culturally and in every sense of business success -- the mission to create more inclusive work environments is a positive development. This move to create a more diverse and inclusive workplace (beyond just playing lip service to it on a website) is pushing employers to evaluate their practices at every level -- from recruitment to learning and development, to terminations and everything in between. Thought leaders and leading practitioners are reckoning with more than just outright discrimination in their talent programs, too. It's now time to dig into the accidentally biased practices that, though unintentionally prejudiced, are problematic nonetheless. And unfortunately, they're also pervasive. Well-meaning managers and recruiters can inadvertently discourage whole groups of would-be applicants by using gendered, ageist or otherwise restrictive terms in job descriptions. Consider postings that use titles such as social media "rock star" or analytics "ninja" -- these are both male-oriented words, and could turn some people off. Another thing to be careful of: labeling certain skills, degrees or experiences "required" when they're really just nice-to-haves. Research shows that women are significantly more likely than men to interpret listed requirements as literally required and forego applying if they don't meet the exact qualifications. Think about where you post your jobs: Are your listings reaching a diverse audience? Do you stick only to mainstream job boards? Are you partial to niche sites, exclusive networks or certain college job hubs? None of these approaches are inherently bad but be mindful of how wide (or not) of a net you're really casting. It's fine to target these sites and networks, but not at the exclusion of other job boards and communities that could just as well send you great candidates. We totally get it. Recruiters are slammed and need to sift through hundreds, sometimes thousands, of resumes. So, it's understandable that they've historically used markers like alma mater or previous employer to quickly cut down a giant pile of resumes. But, consider the baked-in privilege and prejudice that's perpetuated with this approach. By favoring certain universities or companies, you're adopting other institutions' admissions or selection criteria, which are undoubtedly rife with their own biases. 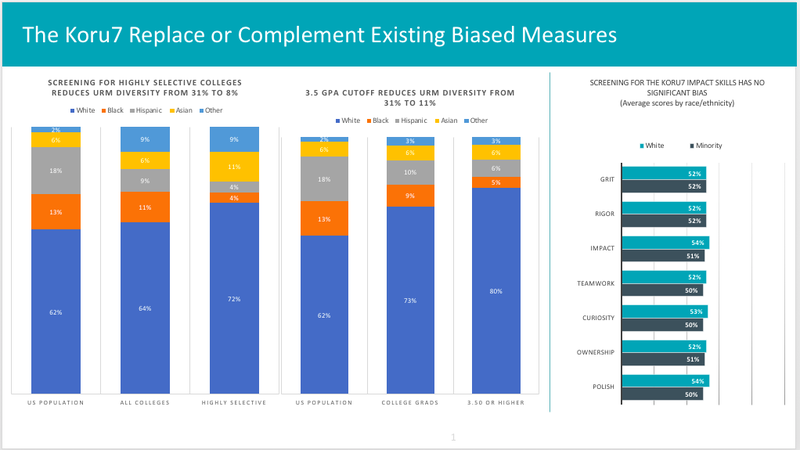 Check out how diversity in a talent pool changes for campus recruiting initiatives when filtering for school or GPA. As the data shows, if you screen by top brand colleges, you reduce the opportunity for underrepresented minorities by 23 percent. Even the most informed, most kind-hearted, most self-aware humans among us are not entirely objective. No one is immune to developing implicit biases, the automatic assumptions and generalizations based on society's stereotypes we all subconsciously make. Unfortunately, these skewed views often go unchecked in the interview process due to using a non-diverse mix of interviewers. Having multiple backgrounds and worldviews in the interview loop helps counter incorrect presumptions and illegitimate hiring decisions. When you're hiring for a particular role at your company, do your interviewers ask a consistent set of questions or do they ask whatever's on top of mind? Do each of the interviewers follow the same framework for assessing and ranking candidates from interview to interview? It seems obvious that standardizing all elements of the interview process is the only way to make it fair, but too often, things are a little (or a lot) less streamlined. And when things are loose, the door for bias is left open. Moreover, they aren't effective anyways. An unstructured interview adds only 8 percent to the predictive power of knowing someone's raw intelligence alone. We have all heard of "the beer test" and "mini-me hiring," or at least the general concepts behind them: hiring someone based on if you'd enjoy having a beer with them, or hiring someone who reminds you of yourself, respectively. These are pretty plainly biased ways of choosing a new team member, but people aren't always aware they're engaging in them (diverse panels and structured interviews really help here). Two related issues under the likeness/likeability umbrella are: hiring based on communication skills (really, interviewing skills) and hiring for "culture fit" (when your culture itself contains biases). In the former, a strong interviewee can beat out a more qualified candidate just by virtue of being more likeable or sounding more competent. In the latter, a great candidate can be overlooked because he or she is deemed "not a fit" -- which itself is a perfectly fine reason to pass on someone, but only if your cultural principles are free of bias. The HR world has certainly made progress on reducing bias and increasing diversity, but there's still a long way to go. The more recruiters and talent leaders examine their organizations' hiring habits, the more they uncover, and the more things improve. Take these examples and run with them -- and let's all keep looking, listening, and learning.